"I'll do as I please!" willfully shouted a small child to an eIder member of the household, whereupon the elder replied, "My child, you shall do as you please in this house, ONLY so long as you PLEASE TO DO RIGHT!" How wise was that correction and, surprisingly enough, the child accepted it! Now, let us ask, "WHAT IS RIGHT?" You may say, "What is right for one, is not right for another." True, in some instances perhaps, but on the whole, whatever agrees with "The Golden Rule" — "Do unto others as you would have others do unto you" is ALWAYS RIGHT! What is God's Will? God's Will is GOOD WILL TO ALL, the HIGHEST GOOD FOR ALL because all that lives, animate and inanimate, is a part of God's Life. When one expands Kindness, Peace, Comfort, Happiness, Generosity, Forgiveness — in fact any or all of the God Qualities — that one is doing GOD'S WILL. No individual lives unto himself alone. Sometimes folks say, "I am not harming anyone but myself." That is NOT TRUE — all life is ONE, and what harms one harms all. One cell in the body cannot isolate itself and live, for if it SHOULD so cut itself off, it would die. So it is with people. No one can successfully isolate himself from life, or he would instantly cease to be. Do you see? Therefore what blesses one part of life blesses all. When a single individual gains self-control over even a part of his world, that benefits all life to a certain extent and if one should allow himself to be distressed for any reason whatsoever (the cause matters not), ALL life is affected to a certain extent. God emanated the Reality of man from the Essence of Himself — therefore He intended man to live like Him — to emulate His Goodness and Almighty Perfection, sustain and expand It in the universe so there would be more of GOD IN ACTION everywhere. Each Individualization, so far as man himself is concerned, was given free will like God Himself, given an opportunity to expand greater and greater God-likeness in the universe. Now, if this Plan is so Lovely and Perfect, giving to Its Individualization EVERYTHING that Individual could possibly desire for Happiness, WHY DOES MAN RESIST GOD'S WILL? The real truth of the matter is that he does not! The REAL MAN — and the Life and Light in the Immortal Flame of Truth within each Heart — DOES NOT resist or fear God's Will. That which fears and tries to defy that Will is the unfortunate accumulation of substance discordantly qualified by thoughts and feelings of the outer mind which KNOWS, mind you, (because it is intelligent) that its existence in the universe is NOT GOD'S WILL and it knows that it MUST cease to be when its creator accepts the Will of God — ALL GOOD — as its birthright. One of the Great Ones has said, "There is really no such thing as failure in the universe — there is only delay!" 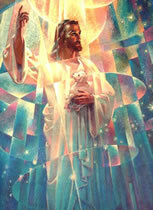 All came forth FROM God and all shall return TO HIM one day, but mankind by that very free will and Power of God with which he is endowed, can HASTEN the day of fulfillment of the Divine Plan by his conscious, determined efforts to improve himself and bring "good will to men" everywhere he goes. 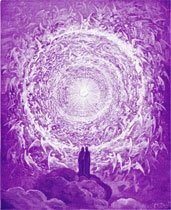 I call Legions of Angels of Cosmic Christ Accomplishment to surround, Protect, Illumine and Supply all who wish to live this way — God's Way! This article by Mary Innocente, the mother of Geraldine Innocente, was originally published in the January 1954 The Bridge to Freedom Journal. 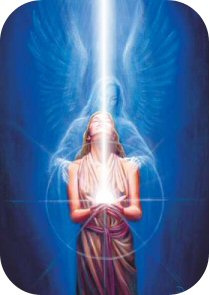 She gained Immortal Freedom in the Victory of the Ascension, reuniting with her "I AM Presence" on March 7, 1960 - becoming the Ascended Lady Master Dawn.